Haddonfield residents and businesses can tee off to help local teachers next month. The Haddonfield Educational Trust is once again hosting one of its major fundraisers of the year with the annual golf tournament and family barbecue fundraiser. The event will take place on June 20 with registration beginning at 11 a.m., a shotgun start at noon and a family barbecue at 5 p.m. at Tavistock Country Club. Proceeds will help raise money for teacher grants in Haddonfield Public Schools. “This event is for the Haddonfield community. Everything goes toward the teacher grants. 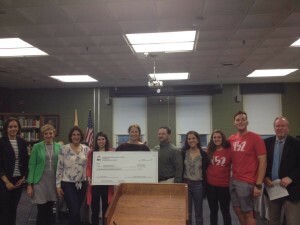 Our goal is to keep providing for the teachers, but this is also a great way to celebrate the Haddonfield community and Haddonfield school district,” Sarah Tambussi, president of the HET Board of Trustees, said. The HET is a non-profit foundation dedicated to supporting the educational quality of HPS and its students through supplemental fundraising from public donors, corporate partnerships, grant opportunities, scholarships and community outreach. It has raised money for various projects in the past with items such as student scholarships, the Central Elementary School playground and the turf field. Last year, the HET decided to start something new with its golf tournament. Raising $15,000 last year, the money was distributed to HPS teachers through HET’s Innovative Teacher Grant Program. Grants contributed to programs at the elementary, middle and high school levels and included projects ranging from civics to foreign language, and from Shakespeare to STEAM. Because of its success, the HET Board of Trustees voted to continue the program this year, and proceeds raised from the 2016 Golf Tournament and Family Barbecue will once again support teacher grants. “The grant program supports innovative programming that would not be otherwise funded through the district’s regular operating budget,” Tambussi said. For the golf tournament, businesses sponsor golfers, community members form a group or individuals can sign up to play golf at Tavistock Country Club. Each ticket includes golf, a golf cart, a boxed lunch, barbecue dinner, shirt and prizes. Prices for golfing range. For more details, visit haddonfieldeducationaltrust.org/golf-event-and-family-bbq/. After golfing, a family barbecue will be held at the club where there will be food, awards, prizes and fun. Tickets to attend only the barbecue are $40 per adult, $12 per child and $100 for two adults and up to five children. According to Tambussi, the golf tournament and family barbecue is a great way to enjoy the day and spend time with people in the community, while helping a good cause. “It’s a great day and an amazing country club. Lots of teachers and administrators come, families have a good time, we give out prizes to best golfers and it all ends with a good positive note for students. We hold the tournament to bring everyone together at the end,” Tambussi said. She hopes those who come become closer to the schools and learn more about HET. he event was very successful last year and it was a great day. It reminds people what we’re doing is to support our school district, it is a great brand for the trust and remind people that we’re here,” Tambussi said. For more information, visit www.haddonfieldeducational trust.org, email hadedutrust@ gmail.com or reach out to a committee member.